Like the boss I used to be pre-pregnancy, Andrew and I killed it in the kitchen Monday evening. Partially fueled by a comment Andrew made a week or so ago that he thought we might be in meal rut (cough, code for make something new please). So, I accepted the challenge and found not one, not two but three new recipes (I actually found four but two had sweet potatoes so I chose one)! I said we could get it done in an hour. It took two. But to be fair I didn't realize I needed to cook rice and potatoes for 30 minutes and needed to use the oven a few times. Plus, I kept flipping through my phone pages to get to the right recipe since we were making them all at once (go big or go home, right?). My sous chef extraordinaire even made me a smoothie to have for work to get those nutrients for the babe (which is bomb and reminds me of a topping that I had on a vegan cheesecake from Four Seasons in Saratoga. O when did I eat it? In September of 2015). Back to the recipes. Three were from Minimalist Baker because they are my go to (actually, let's be serious, they are the only place I look for a recipe, and like I once said I want to go through all their recipes like that Julia Child movie) and the smoothie was from the Full Helping (Andrew looked up blue smoothie recipes). O side note, I made a Minimalist Baker date walnut brownie recipe this past Winter and OMG, I will have to make it again to share. Totally not what I expected. Salivating just thinking about them. Because I ate it tonight and it was so freaking delicious I want to share the Crispy Peanut Tofu Cauliflower Rice Stir Fry. I can't believe how much I have changed in becoming a mature adult and no longer cringing when I hear tofu. I was honestly eating the veggies and tofu out of their individual bowls as I waited to combine them. I mean so good! Open the tofu package, drain it of the excess liquid. Wrap it twice in a paper towel, place on a dish, and put a pot or something heavy on it. Set the oven to 375. Wash all your vegetables. The bok choy can have a lot of dirt in it. Peel your garlic. Assuming you took your sweet time (5-10 minutes) to wash your veggies, unwrap your tofu from the paper towel. 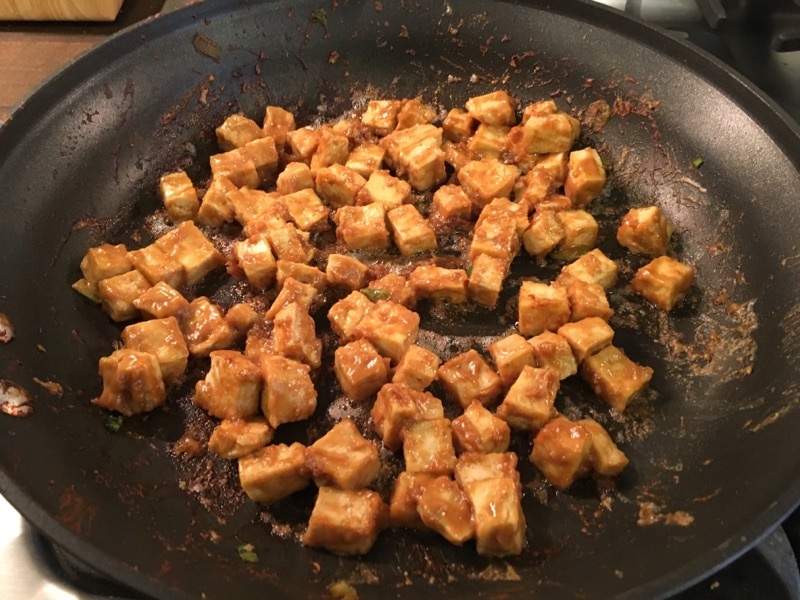 Set on your chopping block and cut the tofu into cubes (think size of dice, but if you are comfortable with tofu make them bigger). On a cooking tray set out parchment paper and then place your tofu so every piece is touching the paper (not on top of each other). Put them in the oven for 25 minutes, tossing a couple of times so they don’t burn on one side. Take out of oven after 25 minutes and set aside to cool. In the meantime get started on your sauce, which really just requires you to put all of the ingredients together in a bowl and whisk together. If it seems thick add some more soy sauce. Set aside. You should still have 10 minutes so you can start on chopping on the veggies. SIDE NOTE: The original recipe used garlic chili sauce, but I didn’t have any so I used Sweet Coconut Chili Sauce. Chop your green onions. Cut the pepper into strips the thickness of your pinky (assuming that is the thinnest finger you own) and then cut in half or you can cube them. For the baby bok choy, we used 5 bunches, 2 of which we cut up and 3 we left as whole leaf pieces. For the broccoli, cut so you have small heads with a stalk. These can all be tossed together in a bowl and set aside. At this point your tofu has probably cooled so you can throw it in the sauce you made and let it marinate for 15 minutes. Tossing lightly. Grab your food processor (two hands, its probably heavy). Throw in the cloves of garlic. Cut the cauliflower into small chunks so they fit in. Shred until it is the consistency of rice. Don’t worry if it is moist, some of the water will heat out when we place it on the pan. Set aside. 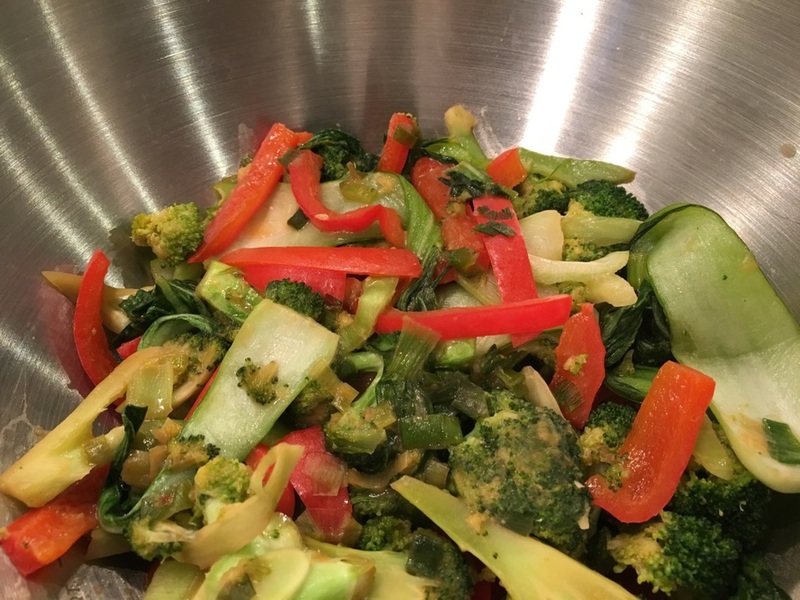 Grab a non-stick pan, 2 teaspoons of sesame oil and throw on your veggies bowl mix (not the cauliflower & garlic). Heat should be low/medium (lower if you think it is burning). Add some soy sauce (not a lot, enough to keep the pan from burning, so maybe a tablespoon or two). We also added some miso because I am obsessed. Sauté until soft. Place back in the original bowl and set aside. On the already warm pan add the tofu (low/medium, or a 2/3 on a gas burner). Set aside any extra sauce. If you sauce was more liquid-like, your tofu will probably crisp. If you kept the sauce thicker it will just thicken more when frying, which it may clump like ours, but still super tasty. Make sure to stir frequently. Time on pan, approximately 5 minutes SIDE NOTE: I marinated mine overnight because I already had other items to eat. Mine was super sticky. But, the sauce is peanut butter flavored so complaints. Just add a little soy sauce at a time to thin out. Set the tofu in a bowl. Clean off your pan with hot water only and either scrape with a wooden spoon or paper towel. 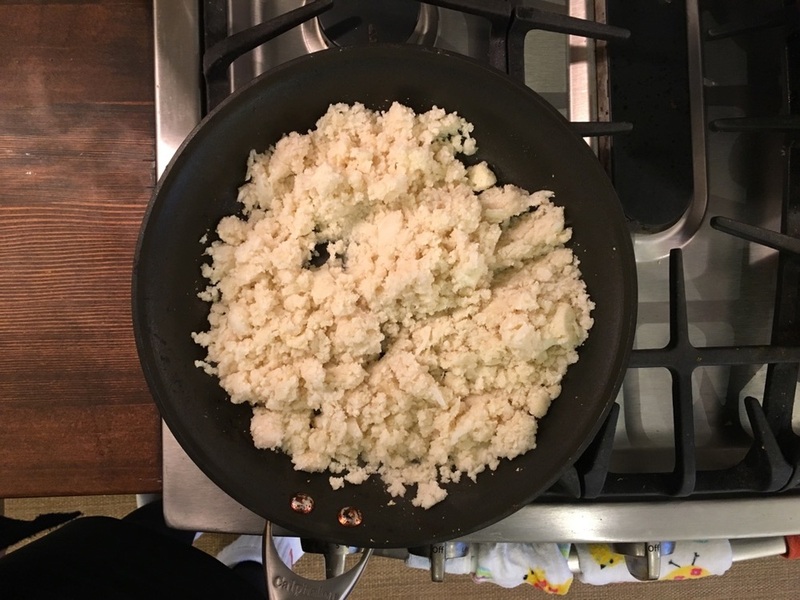 Place pan back on the burner (low/medium or 2/3 if gas) and add a little bit more of the sesame oil (teaspoon or two) and then the cauliflower/garlic mixture. Cover. Mix and once you see it browning (4-5 minutes) add the extra sauce you set aside from your tofu bowl. Mix for another 3 minutes. Voila. Now plate and enjoy the yumminess. It makes four reasonable servings, but Andrew and I really just wanted to split it in half and eat everything in one sitting. We didn’t. But, we probably will when we do round 2 later this week. Bring on the meal rut!
. ..yes I will post a catchy story and the other recipes because I know those of you too chicken to eat tofu (jokes! ), will enjoy them.